artists from Russia, Spain and the USA, the show truly entertains audiences of all ages and cultures. First performed as the interval act of 1994 Eurovision Song Contest in Dublin, this electrifying and innovative dance piece was developed into a full length stage show and broke all box office records during its premières in Dublin, London and New York. 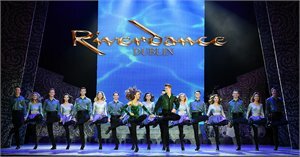 Riverdance has travelled the globe for more than two decades captivating a worldwide live audience of over 25 million fans. NOTE: If there are no hotels available in the city/towns, an alternative hotel in the area surrounding the city/town will be offered. 3 night package is based on check-in on a Mon or Tue. Surcharge applies for check-in on a Thu or Fri. Single traveller and child pricing (2-11 years) are available, please enquire. Ticket to Riverdance will be on the 2nd night. Ticket to Merry Ploughboy will be on the 3rd night. Hop-On Hop-Off tour excludes entry to attractions. PACKAGE TERMS & CONDITIONS: It is our policy to present the cost of our holidays inclusive of all airport and government charges. Please accept however that these charges are not within our control, therefore we reserve the right to pass on any increase.. Travel agent professional service fees where charged, will be additional to the advertised prices. Payment & ticketing deadline-Tickets are instant purchase and must be paid for/ticketed immediately. Valid for sales to 12 Jul 2019. Valid for travel commenced and completed within the period 11 Jun 2019 to 15 Sep 2019 (unless otherwise specified). Min 3 nights stay.Please note there is limited availability on the advertised room types and all pricing is subject to change until a reservation is confirmed. Inventory & availability can change on a daily basis. Strictly subject to availability. All Riverdance tickets are non-refundable and non-transferrable. Riverdance tickets are based on lead-in ticket pricing. Prices shown are based on per person costs in New Zealand Dollars, for payment by cash, cheque or eftpos only. Credit card sales not permitted unless Travel Agent acts as a merchant. Travel requiring an overnight stay in New Zealand will be at passengers own expense. Events beyond our control such as currency fluctuations and changes to the price of aviation fuel may result in prices variations . Strict cancellation fees apply. Packages are based on consecutive nights. For split stays please contact your travel consultant. For full terms and conditions and cancellation fees please contact your local travel agent for more information. Trade enquiries via GO Holidays.